Many of you were probably thrilled to hear the news that Schacht now has a variable dent reed available for both the Cricket and the Flip rigid heddle looms. But what is it, what exactly does this mean for your weaving experience, and how do you go about using it? First of all, what is it? Simply put, the variable dent reed is a rigid heddle reed with interchangeable 5, 8, 10, and 12 dent sections of reed. Each section is 2-3/8” in width, and you can mix and match these sections to create your own custom reed. The number of segments you receive varies with the length of the reed – get the details at our website.The overall weaving width will be slightly narrower than a traditional reed. Let’s talk about when you might choose to use the variable dent reed. One of the most obvious ways would be to combine yarns of different weights in the same warp. Another option would be to create a crammed and spaced effect. This could be done either with yarn of the same weight across the reed, spaced differently, or you could choose to experiment with yarns of different weights at different setts. The variable dent reed is an opportunity to experiment and expand your weaving options in a way that is gentle on your yarn. 1. If your warp is narrower than the full width of the reed, inserting segments to fill the space at both edges can help you keep your warp centered. This also provides a surface area other than the top and bottom bar of the reed to support your hands when beating or changing your shed. 2. Be sure to tighten the Phillips head screws on the underside of your reed before use. 3. Each segment has a smooth edge and a cut edge. Be sure that when you are sliding your segments into place, a smooth edge connects with a cut edge. The cut edge will look notched at the top and bottom. 4. Unless you are looking to create a space in your warp at that location, consider the space between segments a slot. I’ve included two photos that demonstrate the space created when this “slot” is both skipped and used. One shows the warp, and the other shows the space created in the cloth when you skip this slot. 5. You may find that as you wind your cloth onto the cloth beam, thicker sections of fabric will build up more quickly than thinner sections causing a distortion in your fell line (where cloth meets warp). If you are using forgiving yarns, you will likely find that this issue disappears when your fabric is washed and the yarn settles into place. If you are weaving with less forgiving yarns (think linen), I would take this into consideration when planning your project. 6. Wondering what to do with those extra segments when not in use? I sewed a 6” x 9” drawstring pouch to hold the extra pieces. Add a bit of seam allowance at the edges. This would be a quick little weaving project! I’ve woven two simple scarves to demonstrate both the crammed and spaced technique and the mixed fibers technique. The possibilities are endless! Like many people who have a long, cold winter, I start to get antsy for spring by the time February rolls around. I wanted to create a scarf that was warm enough to protect me from Old Man Winter, but thumbed its nose in his direction. With summery seersucker and gingham fabrics in mind, I created a fulled wool fabric that pays homage to both – bright and cheerful with a slightly puckered look. The marigold is warped through the 12-dent segments (28 ends) and the white is warped through the 8-dent segments (20 ends). As I wanted a balanced weave, I wove 28 ends of marigold, then 20 ends of white, repeated for the full length of the warp. You will see that the squares where the white intersects are the most loosely woven, and the squares where the yellow intersects are more tightly woven. The white areas will full the most, causing the surrounding squares to pucker in response. I may yet use this fabric to make a jacket, so I decided not to knot the fringe. Instead, I did a simple zigzag stitch (use a walking foot if you have one) to secure the cut ends, then cut the fringe to about 2”. The cloth went straight into the washing machine on warm for a regular cycle, and I air dried it from there as my washing machine had done the job. If you don’t have experience fulling woven fabric, and more specifically fabric woven with Harrisville Shetland you may want to keep your eye on things. I lost just over a quarter of both the length and the width in the fulling process. But this yarn softens up so nicely, and it’s virtually wind-proof once fulled. Berroco Ultra Alpaca – two colors – 130 yds ea. Warp the Manos through the first 5-dent segment, the Noro through the 10-dent segment, the first Ultra Alpaca through the 8-dent segment, the Manos again through a 5-dent segment, and the other Ultra Alpaca through a final 8-dent segment. Be sure to warp through that space between reed sections. This is simple to weave – just a plain weave, woven using the same yarns you used in your warp and following the same color sequence in your weft. You are welcome to be particular and weave the exact number of picks of each color to match the number of ends in your warp, or you can eyeball it. When using yarns of different weights, you may find that adjusting the number of weft picks of a particular yarn sometimes works better visually. Overhand knot your warp ends, and trim the fringe to about an inch longer than where you want it to be. 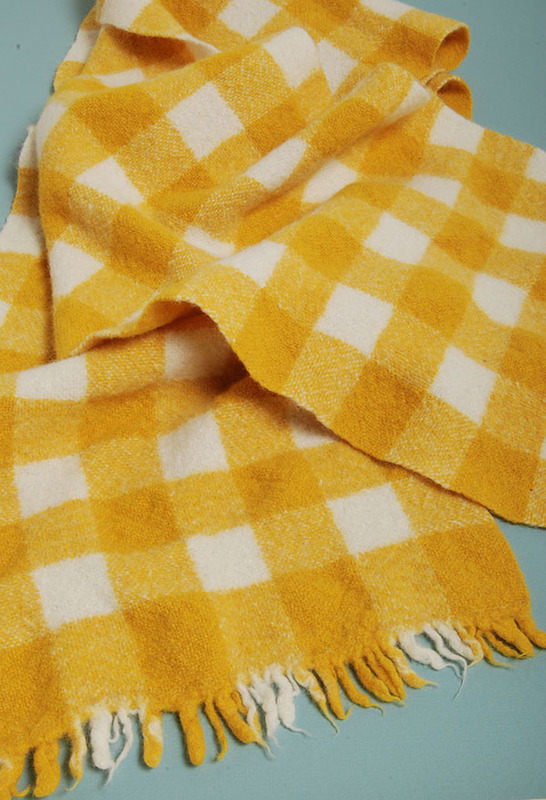 Wash your scarf gently in warm water and a bit of soap, being careful not to agitate the piece too much. You want the fibers to settle in to their space, but not full. Roll the scarf up in a towel and gently press to remove excess water. Hang to dry and re-trim your fringe to the desired length.